Are You Ready for OSX? The Mac community has been buzzing about Mac OS X for years. But even Apple admits that OS X’s previous incarnations—from last year’s beta to this spring’s first “final” release—were only for people who wanted to experiment with and explore the operating system’s new features. For these early adopters, OS X was a glimpse into the future—the rest of us just sat back and waited for the future to arrive. Apple’s new version of the OS, Mac OS X 10.1, is what we’ve been waiting for. With improved reliability, dramatic speed boosts, many interface improvements, and a clutch of native software, this release is the first version of OS X that’s truly ready for general use. Although Mac OS X is still not a feature-for-feature match for Mac OS 9, it’s no longer a step backward (see “Are You Ready for OS X?” June 2001). This version combines much of OS 9’s functionality with a collection of improvements that make upgrading to OS X a serious possibility for even dyed-in-the-wool devotees of the classic Mac OS. Most Mac OS users asked Apple to improve OS X’s performance before adding whizzy new interface additions or networking utilities—the fact is, the first version of OS X was slow. Fast and Furious Apple says version 10.1 is “all about performance,” and our tests bear that claim out. The Finder is now quick to respond to clicks, double-clicks, and drags—in many cases, OS X’s responses are now faster than OS 9’s. Menus drop from the menu bar much faster than they did in version 10.0, and a moderate-size folder can now be copied in the blink of an eye. Application launches are also much faster in this version. When a couple of programs are running, a new program launches in a single “bounce” of its icon in the Dock. The more programs you have running, the longer launching a new one takes, but starting apps is no longer the trial it was in the initial release of OS X. Lab Testing Macworld Lab compared Mac OS X 10.1 with Mac OS X 10.0.4 and OS 9.2.1, and found that the new version of OS X was clearly faster than its predecessor (see “A New 10”). 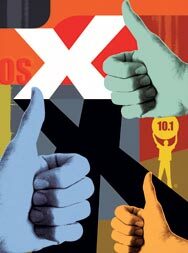 OS X 10.1 also tended to be as fast as or faster than OS 9 on G4 systems, but it was slower on G3 Macs. Generally, drawing on-screen graphics has gotten a big boost in version 10.1, especially in the 3-D realm. According to Apple, the speed of graphics drawn via OpenGL has increased by 20 percent in this release. In addition, OS X 10.1 offers native support of the GeForce3 acceleration card. In our graphics-intensive Quake III tests, version 10.1 was clearly faster than version 10.0.4, but it was slower than OS 9 on all systems except the dual-processor 800MHz Power Mac G4. Oddly, OS X 10.1 actually performed worse than version 10.0.4 on our PDF scrolling test—and both lagged very far behind OS 9. According to Apple, every dimension of the operating system has been modified to improve performance—the virtual memory system, the file system, the graphics subsystems—and there have been innumerable small speed improvements as well. Our tests verify Apple’s claims. The most impressive improvement was in iMovie rendering, which was almost twice as fast in version 10.1 as in version 10.0.4. And the speed boosts aren’t limited to OS X–native applications. Our tests show that applications tend to run almost twice as fast in OS X 10.1’s Classic environment as they do in OS 9. Most actions in our Photoshop 6.0 tests took only a few seconds longer in OS X 10.1 than in OS 9—but they were faster under OS X 10.1 than under OS X 10.0.4. The result of Apple’s tweaks to OS X is an operating system that feels eminently usable, a big change from the hair-pulling experience that was version 10.0. Giving Mac OS X a speed boost may have been Apple’s primary focus, but Mac OS X 10.1 also features a host of interface changes. Some new additions boost productivity, while others are tweaks to poorly thought-out features from OS X’s first release (see “Mac OS X Face-lift”). Dock Tweaks The biggest change to the Mac interface in OS X was the addition of the Dock, a strip of icons showing running applications and minimized windows while also functioning as a launcher for commonly used items. You can now move the Dock from its standard position at the bottom of the screen to either the left or the right, and other changes have been made. Apple now offers two options for minimizing and maximizing windows when you move windows into or out of the Dock. In addition to the much-ballyhooed “genie” effect, there’s a subtler and much faster scaling effect, which shrinks a window (without any processor-intensive warping effect) that’s on its way to the Dock. Take Out the Trash Another tweak to the Dock alters an interface quirk that’s been with the Mac since it was introduced: namely, the mixed metaphor that is the Trash. Logically, when you put a document into something called “the Trash,” you expect it to be thrown away. But does it make sense, especially for novice users, that you drag a disk to the Trash to eject it? In OS X 10.1, the icon transforms itself based on context: the familiar garbage-can icon remains when you drag a document to the Trash; an eject-button icon appears when you drag a removable disk to the Trash; and a “burn” icon shows up when you drag to the Trash a CD-R that’s destined to be burned with OS X’s new data CD-burning features. Quick Access In OS X’s original release, controls for many common system preferences were hidden deep in the System Preferences application. In version 10.1, Apple has brought them to the forefront by adding a series of icon menus to the right-hand corner of the Mac OS menu bar. This new method lets you view a portable Mac’s battery status, set your system volume, monitor AirPort signal strength, choose AirPort servers, and modify display and networking settings—and it’s as easy as using Mac OS 9’s Control Strip. Even the clock in the top right corner is now a drop-down menu—if you click on it, you can see the weekday, date, and time, and have quick access to clock settings and the Date & Time preference panel. You can rearrange menu-bar items by Command-clicking and dragging them into position. You can also remove an item by Command-clicking and dragging it off the menu bar; then you simply watch it disappear in a puff of smoke—much easier than turning it off via its preference panel. Docking Control Although Apple prefers that third-party software developers not add items to the menu bar, some have done so—Aladdin, for example, with StuffIt Deluxe 2.6.5. These, however, cannot be moved or removed. Alternatively, developers can create items whose icons sit in the Dock and provide a set of commands when control-clicked on. For example, a future, OS X–savvy version of Palm Desktop might have an icon in the Dock that revealed the current day’s appointments and to-dos, as well as shortcuts to launching the full Palm Desktop application or making a quick appointment. Apple itself is taking advantage of this technology. iTunes—now part of OS X—offers a contextual menu, which indicates the title and artist of the currently playing track and gives you pause and track controls, in the Dock. Preference Order In the first release of Mac OS X, Apple replaced control panels with the System Preferences application, a multipaned window with 21 preference items to click on. For users still trying to adapt to life without control panels, the sea of icons in System Preferences was especially confusing. With 10.1, Apple has tried to clean up the System Preferences application, dividing preference icons into four categories: Personal, Hardware, Internet & Network, and System. A few preferences behind those icons have changed, too. For example, the Desktop preference panel’s Desktop Pictures option now lets you view a folder’s picture files as thumbnails, making it easier to select a picture to place on your desktop. If you want to enable or disable any of OS X 10.1’s new menu-bar icons, you do that via the relevant preference-panel settings, such as the new Show Displays In Menu Bar option in the Displays preference panel. Improved Access There’s one new preference panel in Mac OS X 10.1: Universal Access. Like the Easy Access tool found in the classic Mac OS, Universal Access serves people who have difficulty using mice or keyboards. From the Keyboard tab, you can activate an option that allows you to enter a sequence of modifier keys as a key combination. For example, if you can press only one key at a time, you can press the command and P keys in succession, instead of simultaneously, to get the Print dialog box. From the Mouse tab, you can enable a feature that lets you use the numbers on your keypad to control the cursor. Or you can eliminate the need for a mouse altogether by opening the Keyboard preferences panel and turning on Full Keyboard Access (control-F1). This feature lets you control the menu bar, the Dock, windows, tool bars, and palettes entirely through the keyboard. While single-user Macs never have to see any Login options, users of shared Macs aren’t so lucky. In OS X 10.0, users had to enter a user name and password to log in to the system. With this version, however, Apple has made OS X’s Login panel just as flexible as OS 9’s—by default, the Login window now displays a list of available users for you to choose from. You can even set up icons for individual users, à la Multiple Users—just visit the Identity pane of the Users preference panel. On-Screen Controls In the original version of Mac OS X, some hardware controls—namely, the brightness and volume controls on Mac laptops’ function keys—didn’t work correctly, and when they did work, you got no feedback that they were working. Now the brightness and volume controls work just as they did in OS 9, though they provide feedback as only Aqua could—when you adjust brightness or volume, a semitransparent icon appears, gives you feedback about your settings, and then gently fades away. Other Choices Version 10.1 also gives back a few interface choices once offered only to users of the classic Mac OS. Through the General preferences panel, you can choose whether your windows’ scroll bars have single- or double-headed arrows at the top and bottom. From the same panel, you can define how many documents and applications appear in the Recent Items submenu of the Apple menu (a feature from OS 9’s Apple Menu Options control panel), and choose the point size at which the system should begin automatically antialiasing text. With Mac OS X, Apple has attempted to make an operating system that’s a good cross-platform partner for Windows PCs, in areas from file names to networking. File Names First off, Apple has radically changed the way the Mac handles file names. Now Mac OS is much more savvy about dealing with Windows-style file-name extensions (.doc, for example)—it can even hide those extensions from you in the Finder (see “True Names and Other Dangers”). In addition to those changes, Mac OS can now handle long file names like those found on Windows files since the advent of Windows 95. In OS X 10.0, files could have names as long as 255 characters, but the Finder couldn’t display them. In version 10.1, the Finder can display file names on two lines when in Icon mode, making it much easier to recognize files with extremely long names. Network Friendly Mac OS X 10.1 not only handles PC files in a friendlier manner but also has a much nicer demeanor when dealing with Windows file servers. Included as part of OS X 10.1 is a Server Message Block (SMB) client, meaning that Macs can now connect to PC servers without the assistance of an add-on such as Thursby Software’s Dave. A Little DAV’ll Do Ya WebDAV is an increasingly popular file-sharing method, especially among Web designers. WebDAV uses Web-server technology to create file-sharing connections with less overhead than traditional networking protocols. WebDAV has been implemented in products such as Adobe GoLive and Macromedia Dreamweaver. OS X offered some support for it, but Apple has improved OS X’s WebDAV support—so much that its entire iTools file-sharing service has been connected to the new protocol. When you connect to iTools in OS X 10.1, you’re using WebDAV. Since WebDAV is based on Web technology, it works like a Web server: connections are made only when data needs to be transferred. That’s in contrast to old-style networking protocols, which required a constantly open connection and an ongoing dialog between the server and the client. The result should be more reliable network connections (no more “server has disconnected” warnings after a period of disuse), as well as compatibility with a whole new collection of servers, especially Web servers commonly accessed by Web designers.